Alison's Garden is the area on Coral between Britannia, the former La Cascada restaurant and Octopus's Garden. Lina, Patricia, the garbage company GIRRSA, Chilo and the guys have been working diligently to create a garden space there to discourage the throwing of garbage in this area. Now with the help of the municipality, the area has been posted with a "no garbage" sign. Thank you for such community cooperation. The Moss family, benefactors of the Kids Club, have tried for years to get the drainage problem repaired on Camaron. They have a house on Camaron that is difficult and sometimes impossible to get to because of the washed-out street. With every storm the street disappears to rubble. Then the Moss family has the road graded at their own expense, to no avail with the next storm. Water runs off the hills, then follows the lowest area by running down Atun past Salud and in turn runs down Camaron. Some parts of Camaron are impassable year round. After much begging of Dr Pimiento, the regador who lives in La Cruz, and the municipality to PLEASE DO SOMETHING - the cries have been heard. President Jaime Cuevas and other officials made a presentation to the public and newspapers on Tues, Sept 18, at 8 AM. Lina Bureau as part of Amigos, was feted as being a mover and shaker in La Cruz. She has even been given the "honor" of helping to oversee the construction of the new drainage system and street. The drainage and road are scheduled for total repair, fingers crossed, by the end of December - Merry Christmas! Please consider donating to Amigos, in part to support Recycling and Landscaping. We need your assistance. Donate to our registered charity AMIGOS DE LA CRUZ DE HUANACAXTLE, A.C. Tax receipts available in Mexico, USA and Canada, see our website at www.amigoslacruz.org. Questions? Call or email Amy Welch USA (503) 516-4757, amywelchpdx@comcast.net. 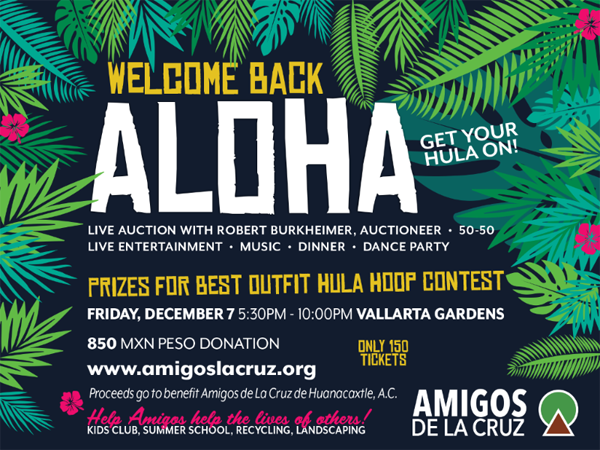 ... and please attend our Amigos' fundraisers this season, the first one is on December 7th...more information and tickets are available now. "ALOHA"
To contribute to the quality of life in the community of La Cruz de Huanacaxtle through cultural, educational, environmental and charitable assistance programs. This content was submitted by a member of the community. We'd like to hear from you, too! To share stories, photos, video or events for our calendar, please send them here.